Without a doubt, the summer of 1989 belonged to Batman. Tim Burton's cinematic reinvention of the Dark Knight was the undisputed king of the summer blockbusters. It dominated the box office and making a killing just off the merchandising alone. But to me, there was only one movie worth seeing that summer, and it wasn't Batman... it was Ghostbusters II. I couldn't get enough of the Ghostbusters at the time; I owned all the toys and merchandise and all that stuff, and had practically worn out my VHS copy of the first movie. So when I heard that a sequel was in the works, I was as excited as a seven-year-old boy could get. It's actually the first movie I can remember seeing in a theater, believe it or not. But while Ghostbusters II is special to me in that aspect, time has not been as kind to it as it's been to the first movie. It's actually kinda mediocre when you compare it to its predecessor, but I believe it's still worth a watch. So let's check out why that is. Five years have passed since the Ghostbusters saved New York City from the wrath of Gozer. However, it hasn't been a happy five years. All the collateral damage caused during the battle with Gozer led to a judge issuing an injunction against the Ghostbusters, preventing them from catching ghosts and essentially putting them out of business. In the time since then, the four have moved on. Peter Venkman (Bill Murray) hosts a local television show where he essentially mocks guests claiming to have psychic abilities, Egon Spengler (Harold Ramis) is a researcher studying behavioral sciences, and Ray Stantz (Dan Aykroyd) runs an occult bookstore while occasionally teaming with Winston Zeddemore (Ernie Hudson) to occasionally revive the Ghostbuster name as entertainers for children's birthday parties. But something is about to pull them all back together again. After the stroller containing her infant son Oscar (Hank and Will Deutschendorf) goes flying into the street under its own power, Dana Barrett (Sigourney Weaver)  now a painting restorer at the Manhattan Museum of Art  seeks out her old friends in order to find out why. The search leads Peter, Egon, and Ray to an intersection near Dana's apartment building, where, posing as city employees, they start drilling into First Avenue. Ray draws the short straw and gets lowered down into their hole, where he discovers an enormous river of pink slime flowing along the long-abandoned pneumatic railroad lines. He procures a sample of the slime, but as he's being lifted out, he accidentally kicks a power line and sends all of Manhattan into a blackout. Thanks to this and the fact that they were digging up the street without anything so much as resembling a permit, the cops haul them in. It doesn't help them any that they had all their ghostbusting equipment in their truck, which puts them in violation of the aforementioned injunction. Peter, Egon, and Ray are sent to trial, ending up with Louis Tully (Rick Moranis) as their incompetent attorney while facing a judge (Harris Yulin) that is grossly biased against them. So biased, in fact, that after the judge sentences them to eighteen months in prison, he goes on an angry tirade that culminates with the judge telling the three Ghostbusters that he'd have them burned at the stake if he could. The judge's rage causes the slime sample  which had been entered as evidence  to explode, releasing the vindictive ghosts of two murderers that the judge had sent to the electric chair years earlier. Panicking, the judge dismisses the case and rescinds the injunction, allowing Peter, Egon, and Ray to suit up and bust the ghosts. The Ghostbusters officially reopen their business as paranormal investigators and eliminators. But as they return to their previous glory, Peter tries rekindling his past relationship with Dana while the others investigate the river of slime. Turns out that the slime is empathic, and it feeds on the emotions off those around it. They even trace the slime river to a definitive source: beneath the Manhattan Museum of Art. This is particular interest of the Ghostbusters, who have reason to believe that a painting of 16th-century Moldavian dictator Vigo the Carpathian (Wilhelm von Homburg) that Dana had been working on may have some connection to the supernatural. And you know what? It does have some connection to the supernatural. Turns out that Vigo's spirit is contained within the painting, and Vigo has turned Dana's boss, Janosz Poha (Peter MacNicol), into his own personal sidekick. He also gives the possessed Janosz some directions: bring him a child, so that he may transfer his soul into the child at the stroke of midnight on New Year's Eve and live again. And Janosz has found the perfect child: Dana's son. So you just know that the Ghostbusters and Vigo are going to have a showdown. Janosz successfully kidnaps Oscar and traps Dana after she makes an ill-advised rescue attempt by herself, while all hell begins to break loose as the city's New Year's parties begin to kick into high gear. It's up to the Ghostbusters to crack the seemingly impenetrable cocoon of slime surrounding the museum, defeat Vigo, and save the world once again. Ghostbusters II isn't a bad movie at all. Unfortunately, I don't believe it's as strong as the original movie. I simply got the impression that they were truing to catch lightning in a bottle a second time, and despite the movie's box office success (a worldwide gross of 215 million dollars), I don't know if I'd put it on a pedestal like its predecessor. Don't get me wrong, Ghostbusters II is entertaining. But it just feels like some of the magic was lost in the five years between the two. Let's go with Ivan Reitman's direction first. Teaming with cinematographer Michael Chapman, Reitman once again crafts a movie that is visually astounding. Ghostbusters II isn't a movie that demands anything extremely flashy when it comes to direction or camerawork, but Reitman does a fantastic job in setting and keeping the movie's tone. This is assisted by the musical score composed by Randy Edelman. Instead of simply reprising Elmer Bernstein's music from the first movie, Edelman goes his own way and does a great job enhancing the movie's atmosphere. Whether it be something comedic, something frightening, or something heroic, Edelman is up to task. The original songs comprising the movie's soundtrack  performed by high-profile acts like Run-DMC, Bobby Brown, Doug E. Fresh, Oingo Boingo, and Glenn Frey from the Eagles  aren't bad either, though I don't think they'd hold up outside of the context of the movie. I should also compliment the visual effects created by Industrial Light & Magic. Though there is an instance or two of the effects not completely blending in with their surroundings, scenes like the Ghostbusters fighting the courthouse ghosts and the Statue of Liberty walking through Manhattan are amazingly effective in drawing the audience in. That's why ILM is the best at what they do, folks. Up next is the screenplay, once again penned by Harold Ramis and Dan Aykroyd. Instead of being a straight comedy like it could have been, Ramis and Aykroyd instead spread the humor thinly over the movie's 108-minute running time. Doing that allows them to establish some drama, a little horror, and even some romance with the Peter/Dana subplot. It's some very good writing, but I didn't feel that the script was one of the movie's strongest elements. I can't exactly put my finger on anything specific that bothers me, but it doesn't seem as charming as Ramis and Aykroyd's script for the first movie. I wish I could say what it was bugging me so much, I really do. Last but not least is the cast. Practically every major player from the first movie is back, and everyone does a perfect job, specifically our leads. Bill Murray, Ramis, and Aykroyd are wonderfully entertaining, having a great comedic chemistry together. Murray also has a warm, amiable chemistry with Sigourney Weaver, who turns in a fine performance as the straight man (straight woman?) to the antics of the Ghostbusters. Unfortunately, it seems like they couldn't come up with anything for the other returning actors. 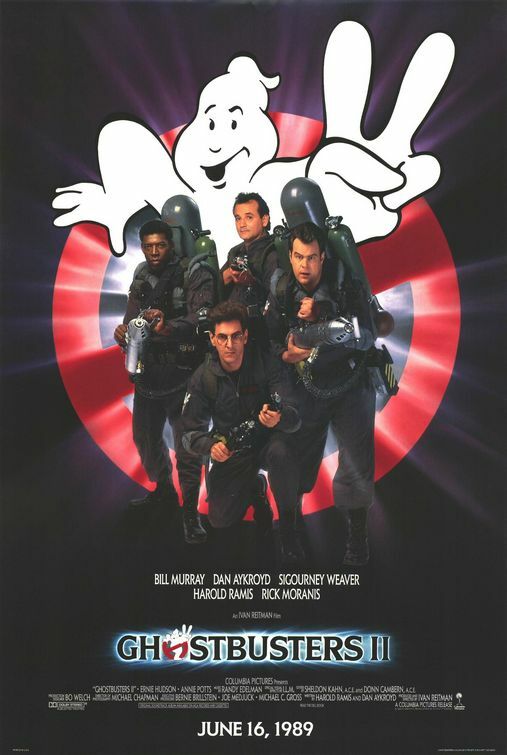 Annie Potts is barely in the movie at all, while Ernie Hudson has only a handful of scenes despite being a Ghostbuster. Moranis fares the best, with a number of well-done important scenes and a funny mini-subplot with Slimer. Of our antagonists, Peter MacNicol is the most notable, enthusiastically overacting and perhaps being more entertaining than the character should have been. Wilhelm von Homburg isn't given a whole lot to do until the climax, but he sure can deliver one intimidating monologue. And in an extremely minor and pretty much useless role, Kurt Fuller isn't bad as the mayor's sleazy assistant. I think the only reason the character was included in the movie was they thought the Ghostbuster-hating idiot bureaucrat worked so well in the first movie, they'd use a similar character in the sequel. The character has no real purpose, and the subplot where he has the Ghostbusters locked up in Bellevue's psychiatric ward seems like a whole lot of filler. As I said in the opening paragraph, Ghostbusters II is a special movie to me. However, that doesn't make me blind to the fact that it very nearly falls victim to a nasty case of "sequelitis." It's not as good as the first movie, but that doesn't necessarily make it a bad movie like other sequels out there. There's still a lot of good in Ghostbusters II, so I think it's worth a watch. My final verdict is three and a half stars, and I hope that one day, there'll be a Ghostbusters III to close out the trilogy.